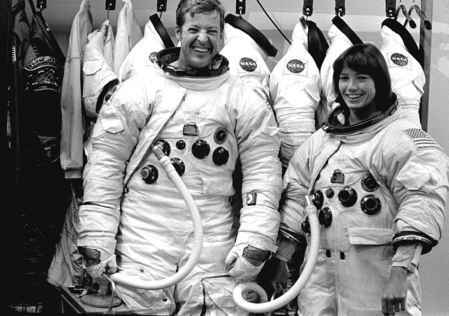 In February 1980, Joe Kerwin and Group 8 astronaut Anna Fisher undertook weightless training for an axial scientific instrument change out on a mock-up modular section of the Hubble Space Telescope in the Marshall Space Flight Center's Neutral Buoyancy Simulator (NBS). support crew for this first Shuttle mission, becoming involved in early flight techniques meetings and flying some simulations to familiarise himself with the way the Shuttle would return to Earth, to aid in his role as Capcom. These simulations lasted from two or three hours up to a couple of days. For this first flight, there was a great deal of nervousness about the re-entry phase of the mission. The launch had occurred without incident and the Shuttle had gone through its paces in orbit, so the most dangerous part of the mission now was the return to Earth. Images revealed some damaged tiles, but not in critical areas, and it seemed that the thermal protection system would be fine for entry and landing. 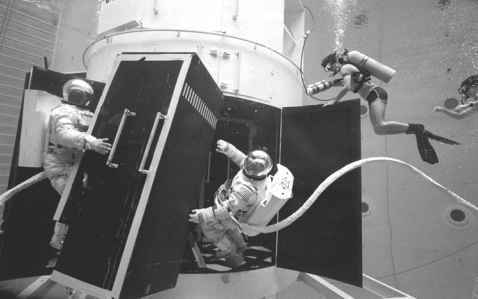 Kerwin and Anna Fisher take part in underwater evaluation of a Hubble Service Mission at the Marshall Space Flight Center in February 1980, ten years before the telescope was launched and nearly fourteen years before the first service mission was flown. Young: "Do I have to take it up to the hanger Joe?" Following the tradition of the Apollo programme, there was a huge post-flight party, celebrating the success that had taken so long to achieve. However, with three more test flights to fly before declaring the STS system operational, there was still plenty of work to do. These flights would be flown by two-man teams of astronauts from the pilot cadre, but for the scientist-astronauts, a successful Orbital Flight Test Program would bring their own chances of flying on subsequent missions that much closer. The second flight of the Shuttle occurred in November 1981 and was intended to be a five-day mission. Problems with a fuel cell saw the flight reduced to a fifty-four-hour "minimum mission'', but the crew still managed to complete most of its assigned tasks, including testing the Canadian-built Remote Manipulator System (RMS), or robot arm. 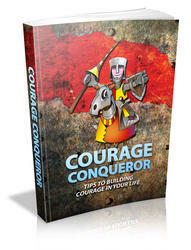 For this mission, Joe Allen was assigned to media support, working with the representatives of the ABC network. STS-2 also highlighted a potential problem with Space Adaptation Syndrome (SAS), namely the possibility of having to bring home the Shuttle when the pilot had not fully adapted to space flight. Joe Engle suffered from SAS upon entering orbit, but would have had time to recover on the full five-day mission (as illustrated by his second flight in 1985). However, due to the minimum mission requirement, he had to bring Columbia home early while he was still dehydrated, causing some concerns during entry and landing. Medical officials decided that a situation could arise during an abort mode, an early return from space or due to crew illness, in which SAS could affect the performance of one or both of the pilots flying the vehicle. They urged that more studies needed to be done early in the Shuttle programme to look specifically at SAS on the ascent into space and the trip home. It was quickly decided to assign physician-astronauts to an early Shuttle flight to determine the symptoms, causes and countermeasures for such an illness. At that time (late 1981), crews for STS-3, 4, 5 and 6 were already in various stages of training, and while it would be possible to place some medical investigations into these flight manifests, it would not be practical to assign a doctor to a crew until STS-7 or STS-8. For STS-4, and again for STS-5, physician Bill Thornton was assigned to medical support out at Edwards Air Base, standing by in case of emergency situations. 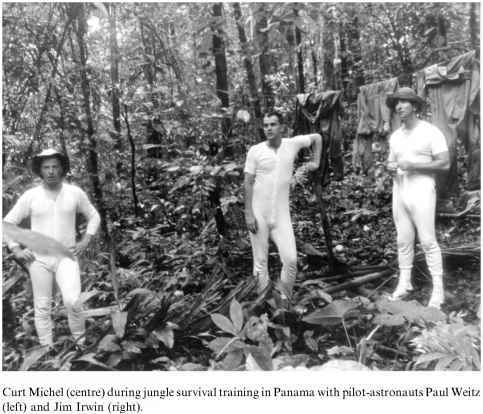 This was one of several early assignments for the few available physician-astronauts, who completed familiarisation and procedures training on helicopters and for evacuation of the crew in the event of a emergency landing and crew retrieval situation. For STS-4 Thornton worked with Jim Bagian, and on STS-5 with Norman Thagard. By late 1981, STS planning schedules included projections for the attrition of "veteran astronauts'' - those chosen prior to the 1978 initial Shuttle-era selection. No names were assigned to these documents which were merely intended as planning documents to manage the large number of flight personnel. It was estimated that by the late 1980s, most of the pre-1980 astronauts (including the 1978 group) would have left the programme. These planning documents also revealed that at the time, NASA was considering teaming up mission specialists in pairs and flying them together on between five and eight missions, to capitalise on their mission experience and to alleviate repetitive training from what would have become a stretched training syllabus.